The Mini Smasher version of the NugSmasher Rosin Extraction system is targeted at personal use because it’s a smaller size rosin press perfect for using at home. The machine is manufactured by NugSmasher in Corona, CA, by Premiere Manufacturing in the company’s 40k square foot machine and fabrication workshop. 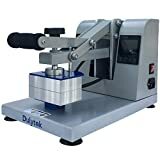 The staff includes experienced engineers, designers, fabricators, and builders who know everything about manufacturing the best rosin presses. The Mini NugSmasher’s size is quite small, and its pressing power is able to generate the best rosin. It’s best for home use rather than commercial use. The Mini NugSmasher rosin press comes ready for use in its package. You won’t need to waste time figuring out how to assemble it in order to work. 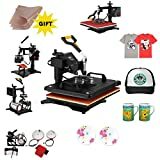 There will be no complicated procedures involved, and all you will have to do will be to plug the rosin press and start pressing your material. The machine comes with steel pressing plates on board that are 2.5 inches in diameter, and they are able to deliver a pressure of two tons. 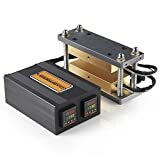 The mini rosin press provides precise temperature control of both the top and the bottom plates. All you have to do is to set the desired temperature, and the controllers will bring the plates to that specific temperature, and they’ll also maintain them there for the whole pressing session. The Mini NugSmasher is a well-equipped machine that requires more power circuits in order to make everything run correctly. Having the safety issue in mind, the manufacturers and the electrical engineers have routed all circuits through high-quality circuit breakers. 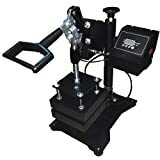 The Mini NugSmasher rosin press comes with a manual pump arm that will turn out very handy especially if you want to fine-tune your pressure. When you reach the desired press time, a smooth turn on the quick release handle will drop your plate for you to be able to retrieve your finished product. After that, you will be able to reload the press again. The Mini NugSmasher rosin press is able to press 3 to 4 grams of material, and this is the optimal quantity for a home rosin press. The machine’s heating can go up to 350 degrees, and it’s not recommended that you exceed this limit because there’s a risk of burning the material. 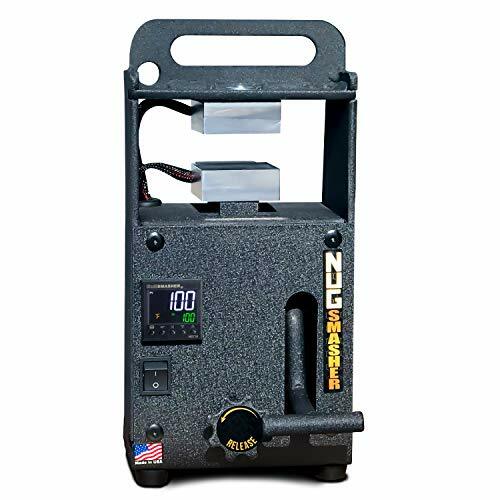 The Mini NugSmasher weighs about 25 lbs, and it’s a very portable device compared to other rosin presses destined for home use. It comes with a very compact design, and this makes it easy to carry it around without getting any help. After I got the Mini NugSmasher, I was happy to see that it came already assembled and all I had to do was to get it out of the box and start reading the instructions on how to use it. It was extremely easy to understand how and what it does so I was able to get to work with it quickly. For personal use, it’s amazing, and it gets the pressing job done extremely quickly. I was able to get some of the best quality rosin after using it. I’m an average home user, and this machine’s features were ideal for me. The pump arm turned out to be extremely comfortable, and the quick release valve was also really easy to grip. This small system was everything I needed, and it turned out to be a really straightforward extractor, ideally suited for pressing a maximum of 3 to 4 grams of cannabis material. The final product was terrific as I already said before, and the rosin preserved the flavor and the potency I expect to get from my extract. This was definitely thanks to the low heat and the high pressure applied with the Mini NugSmasher. Temperature is extremely important when it comes to cannabis material pressing, and the fact that I was able to set my own limits depending on the materials I was pressing was great. I usually set the machine between 1 to 5 minutes while it’s cold pressing because I know that this produces batter consistency of the final product. When I prefer hot pressing, I only set the timer between 45 seconds and three minutes because I know that the result will be an oily consistency. It all depends on the outcome that you are planning to obtain. All in all, this mini rosin press turned out to work flawlessly and up until now I didn’t have any problems with it, and it’s doing its job just the same way it was doing it when I bought it a few months ago. The Mini NugSmasher is ideal for personal use in your own home. The machine is compact and very portable. It comes with a two-tons pressing capacity. It includes press bags to fit the mini press. It’s made of high-quality materials such as solid steel, and this will enhance its lifespan. The machine also includes a manual pump arm. It comes with circuit protection and fast-retract plate release. You will only be able to press a maximum of 4 grams with The Mini NugSmasher, but considering the fact that this is a rosin press for home use, it’s quite enough for a single session. 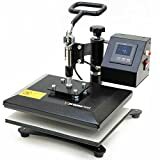 The Mini NugSmasher rosin press comes with a life-long guarantee and the manufacturer, NugSmasher, assists its clients with any questions or issues during the regular business hours. NugSmasher offers 100% coverage for life for all its products. The Mini NugSmasher is the ideal rosin press for home use, and it will turn out to be a smart purchase. 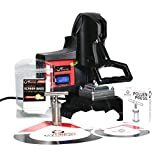 All of its essential parts and components including the solid steel smash plates, the dual heating elements, the circuit protection, the accurate temperature control, the fast retract plate release, and its manual pump arm make it one of the best choices with the mix of necessary features to obtain the best rosin in your own home.